Working with leather is an art; among the oldest skills known to man. Tanning, curing, bending and stitching are skills in which few specialize. Leather craftsmanship becomes even more priceless when the techniques have not changed for over 100 years. 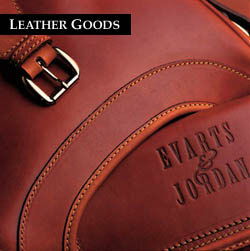 Among the artisans who still employ the oldest methods, is a man who has been working leather since he was 14 years old. Today, Don Francisco Exposito is 62, and with his son Paco and daughter Anna, possesses some of the greatest secrets involved in the handling and working of leather. Tanned and cured in the central part of Spain, the leather is then taken to the province of Jaen, where in a small town, it is worked by hands that have seen over 35 years of experience. Using only the best brass hardware, our products can take hours to hand make; including one that takes 26 hours from start to finish. Our leather goods are beautiful, incredibly durable , and most important of all , highly functional. By combining our most elegant and authentic designs with their finest quality in craftsmanship, the relationship between Evarts & Jordan and Artesanias Exposito has rendered a line of gear that is a true work of art. Exhilarated and eager, we are proud to present this line to our fellow clay and wing shooters around the world.